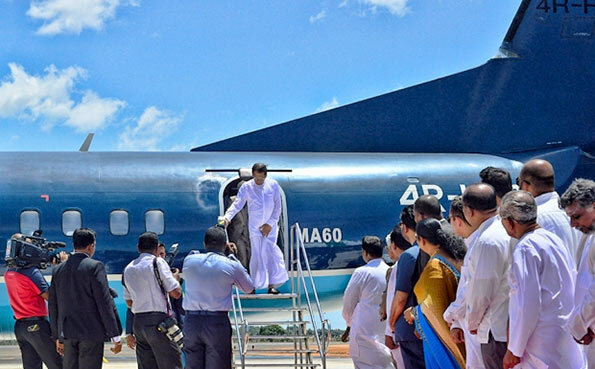 By landing at the Sri Lanka Air Force station Batticaloa in a SLAF MA-60, President Maithripala Sirisena declared open the renovated Batticaloa runway yesterday (10th July). State Minister of Defence Ruwan Wijewardene and Secretary to the Ministry of Defence Eng. Karunasena Hettiarachchi were also present at the opening. President Sirisena was warmly welcomed by the State Minister Wijewardene, Commander of the Air Force Air Marshal GP Bulathsinghala, and many other high ranking government officials. Though the renovation process of extending the runaway length from 1070m to 1560m was initially started in December 2012, it was halted in November 2015 after the process was completed up-to 60%. The construction process of the remaining 40% resumed after a cabinet decision made on 17th December 2015. The remaining construction of the project was started on 15th February 2016 and completed on 25th May 2016. Air Force finished the remaining 40% construction of the runway and the new passenger terminal building with a material cost of Rs 290 million. This is one of the four runways renovated (Anuradhapura, Batticaloa) and constructed (Iranamadu, Mullaittivu) by the SLAF. Ministers, deputy ministers, members of Parliament, chief minister of eastern province, provincial councilors, government officials and large number of SLAF personnel were also present at the occasion. Only thing this president is good is opening events. Hasn’t he got anything better to do. No difference from that Rajapakshe. Ayio the sarong… forgot to wear under “saya”.